AFTER yet another top five finish in 2018, Competition Motorsports return to the infamous 6.213 kilometre-long Bathurst circuit in 2019 to seek out the top spot in class – and outright – at the Liqui-Moly Bathurst 12 Hour. Joined once again by major sponsors Ice Break Extra Shot and Virgin Australia, the stage is set for yet another thrilling weekend of motorsport. In 2019, due to some rule changes, the team will field three drivers, down from the four of previous years. David Calvert-Jones, the driving force behind the Ice Break Extra Shot flown by Virgin Australia entry, returns with two new drivers joining him for what promises to be the toughest Liqui-Moly Bathurst 12 Hour in many years. “Hard not to get excited about this new driver line up. We have a great experienced lead driver with Kevin Estre and then there’s newly minted Porsche Junior Jaxon Evans,” Calvert-Jones said. Talented 22-year-old Kiwi Jaxon Evans joins the team after a standout year racing and winning the Australian Porsche Carrera Cup. He topped this off by the beating ten other international candidates in the Porsche Motorsport Junior Programme and as a result, will compete in the Porsche Mobil 1 Supercup in 2019. “I can’t wait to get back to one of the most iconic circuits in the world, alongside the other drivers in the Ice Break Extra Shot flown by Virgin Porsche,” Evans said. If Jaxon Evans is a young man on his way to motorsport glory, then Kevin Estre is already there. The 30-year-old Frenchman has a truly impressive racing CV and a wealth of experience in multiple categories. In recent years he has spent much time at the wheel of a Porsche 911 RSR with the factory Porsche outfit, snagging a class win at the famed 24 Hours of Le Mans in June this year. “I’m very happy to join Competition Motorsports for the Liqui-Moly Bathurst 12 Hour! David and his team are always competitive and have finished on the overall podium as well as great class results,” said Estre. The general Manager of Marketing at Parmalat Australia, Angela Burr, said her brand was excited to support the team again. 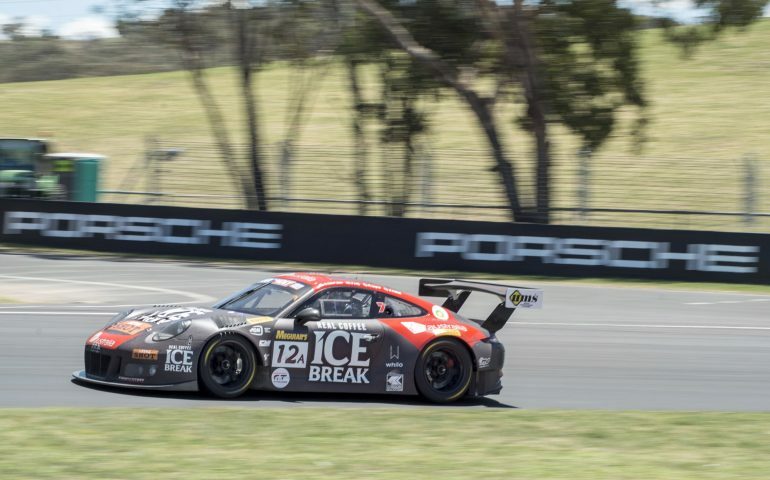 “We are really looking forward to being back at Bathurst with Competition Motorsports in the Ice Break Extra Shot flown by Virgin Australia Porsche. They are a professional and competitive team that have a track record of outstanding performances at this event! Virgin Australia is returning to support the team in 2019 as travel partners and as well as getting the Competition Motorsport drivers and staff to the event, Virgin will once again be offering the public flights to and from Bathurst in 2019. The General Manager of Corporate and Industry Sales at Virgin Australia Ann Elliott said: “Virgin Australia is thrilled to be connecting the Ice Break Extra Shot flown by Virgin Australia motorsport team into multiple cities within Australia from International destinations for the third year running.